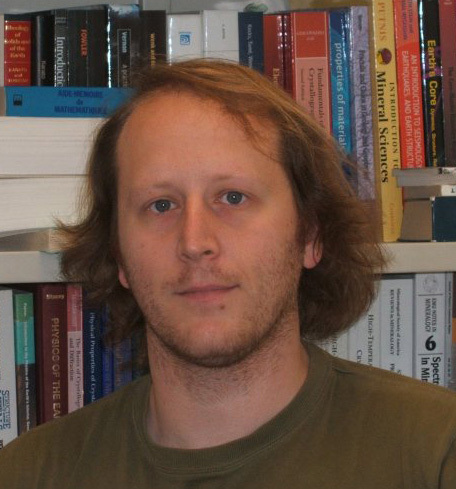 Former Carnegie predoctoral fellow Sébastien Merkel (formerly from the University of California, Berkeley, now at CNRS and the University of Science and Technology of Lille, France - pictured bottom right) and a group that included CDAC partners Tom Duffy (Princeton) and Hans-Rudolf Wenk (Berkeley), and CDAC student Lowell Miyagi (Berkeley) as well as scientists from Arizona State University, the University of Chicago, and HPCAT conducted the first laboratory study of the deformation properties of high-pressure silicate post-perovskite. The work, which was done at the HPCAT facility at the Advanced Photon Source (APS), appears in the June 22 issue of the journal Science [Merkel et al., Science, 316, 1729-1973 (2007]. According to Merkel, "understanding texturing in minerals is important because it is a key parameter when modeling the development of seismic anisotropy with convection. As minerals deform plastically, they become anisotropic. This anisotropy strongly depends on the activated deformation mechanisms and can be observe in seismology. It refers to the fact that seismic waves passing become distorted in a characteristic way. At the moment, we have numerous observations of anisotropy at the core-mantle boundary, the D" layer. However, questions remain on whether this anisotropy is due to the orientation of silicate post-perovskite, partly due the lack of understanding on the plastic behavior of this phase at high pressure." In their experiments, the group studied how a polycrystal of post-perovskite can orient when plastically deformed under the pressures of the core-mantle boundary. Diffraction experiments showed that the orientation that was obtained is compatible with the activation of slip along the (100)-(110) planes. 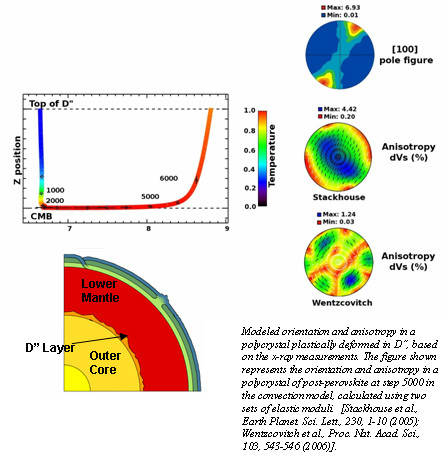 Using this result, a convection model, and polycrystal plasticity, a simulation of the anisotropy induced by post-perovskite plastically deformed in D" gave poor agreement with seismic observations. These results are compatible with previous results obtained on an MgGeO3 analogue last year [S. Merkel, et al., Science, 311, 644-646 (2006)], (see http://cdac.carnegiescience.edu/content/view/137/45/). "However," Merkel explains, "questions remain of why we can not reproduce seismic observations in D". Is the mechanism we found really active at the core-mantle boundary? Is post-perovskite really the source of the observed seismic anisotropy? The future will tell."